It was late in the afternoon as I wandered the tents of the Jordan Valley Big Loop. Half the vendors had closed up and Catie was starting that process herself. I was an out-of-place hot mess in a sea of rodeo fashionistas and fierce lady ropers, having come straight from a branding on the desert. Any improvement in my appearance from earrings and lipstick were dulled by the alkali dust I was covered in, the sweat in my pits, and the fatigue that weighed heavy on my shoulders. Regardless, Catie was as charming and authentic as she appears online. Talk about a great set of qualities that are so rare to find anymore! I had driven over to attend a Trinity Seely concert hosted by Lowell Angle. Lowell had written a song about riding with Catie and I was impressed that much more. Ironically, I was sitting next to last week's #WesternWomenWednesday feature, BoWynn Ashworth and her crew, for the entire show. Que "it's a small world after all..."
So, without further ado, meet Catie Kershner of Kershner Custom Silver! 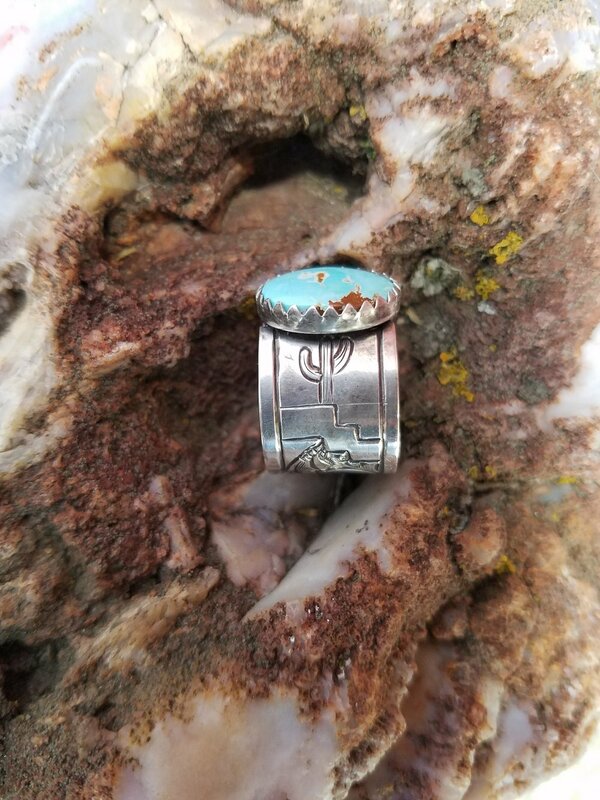 One of Catie's recent pieces, the Southwest Senora', and it is for sale!!! 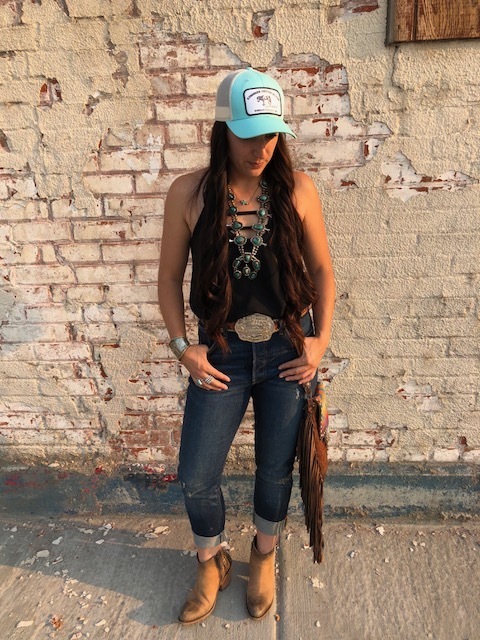 Head over to Kershner Custom Silver and snag it here. 2. Tell us how you got into silver? My family is big on having a way to make money should you ever find yourself without a 9-5 job; something you can take with you and work from anywhere. So we all have “hobbies” if that is what you want to call them. 3. Lots of people "make" stuff. You have taken it a step farther to show how silver is a part of western fashion. How did that come about? I guess probably by accident lol! I definitely use my own personal style and preferences when making pieces so that is shown a lot in my work. And as a woman I know what I’m looking for in a piece of new jewelry or accessory piece so I really use that card often! Would I buy this? What would draw me to purchase a piece? My work and style, like others, isn’t for everyone so it really needs to speak to the buyer and they have to love it. 4. I notice you are a re-seller for a handful of brands. How did you pick which brands to represent? I try to keep my shop? Boutique? Wagon? Whatever it is, full of one of kind items. I try to keep them handmade if at all possible. I like to support other small businesses or carry items that I know not very many other places are carrying them. I’m not going to lie I have done a lot of research to find different brands to add to the value of my business. 5. Your brand recently launched a website (which I love!) Can you talk about the highs and lows of building it and how you feel about it now that its been live for a few months? I LOVE IT!! It was not without it’s struggles though! I went with a different web host to begin with. My debit card got hacked, email and phone number sold and immediately started getting spammed. So that was a definite low!! I switched web hosts and now I am happy to say I am so pleased with how my website is running and functioning!! It was/is a ton of work to get a website up and running and functional. I really wanted it to be something that was inviting, easy to use and manage, and easy to shop. I once again did quite a bit of research and thankful for template website setups that helped me out!! I would love to offer any and all advice from what I learned during this process! Don’t be afraid to ask friends who have websites across different platforms and see what they think! I don’t know why I didn’t get a website sooner!! It has saved me so much time in the long run and I can be sleeping, enjoying family time, whatever it is, and still be making money!! All. The. Hats! I have been rocking my leopard Kershner Custom Hat for over a year and still get compliments! I live over a 100 miles away from Jordan Valley and everyone seems to know Catie, or wants to! Get yours here! 6. The entire time I have followed you online, Christ has been influencer in your brand. What advice do you have for other gals unsure about sharing this in their businesses? The kind of meme you can expect to see from Kershner Custom Silver! Oh man that is a tough one. It wasn’t/isn’t always easy for me to share about and I know I am not always completely authentic or maybe completely personal about it. I like to keep my personal life and struggles personal and quiet, not that I’m not being genuine. You know, I’m human. I struggle daily and I question Christ’s plan for my life. But ultimately I don’t want to live my life without His divine plan. And that includes my business life. I don’t care if you unfollow me because I speak about Christ and my journey with Him. It’s just that; MY journey. He plays such a big role in why I am where I am today in life and business. His great grace has been with me all along. I have so much to be thankful for that I know were blessings directly from God that why not share that in the biggest influencing place? God has been so so good to me; even in times of trial when my faith runs thin, that I want people to know how good He is. For those unsure about sharing Christ and your relationship with Him, I say do it if it’s true to you. I wasn’t always this way with my business. Then I had a coming to Jesus meeting (pun intended), and my life changed. I knew I needed to give my life and my business over to Him. And I still struggle with that, because well I like control, so I pray constantly for His grace and that He gives me strength to submit my life to Him. You have no idea the community of #sistersinchrist out there. Proclaim your faith and all these amazing women come out of the wood works to lift you up to Christ. They lift me up when I’m down. They inspire me in my relationship and journey with Christ. After all we have all been called to be servants of the Lord. 7. Those of us following along have been watching the transformation of a huge trailer. Where are you going?!?! Hasn’t it been a process?!!? I am pretty sure I just love a good challenge lol! I see the diamond in the rough for sure. My next big show for the trailer is Pendleton Round-Up Sept 11-15th!! I will have some things done on it, but it is a work in progress so be watching my insta stories for updates and how things are progressing! And not including the trailer but next setup after Pendleton is VEGAS!!! I’ll be at the brand new RFWA Expo at the Plaza Hotel & Casino with MJ Custom Leather December 5th-15th for all your shopping delights!! 8. How do you feel like growing up in Jordan Valley and cowboying effects who you are and what you do today? Looking at me now you may not ever guess we grew up the way we did. My sister and I grew up working. That’s how it was. We went every where and did every job with my parents. I know growing up that way and seeing how hard our parent’s worked to make a life instilled in us kids a work ethic. And ranching there still has a lot of the traditional values. That lifestyle is to be respected and honored. My ag and ranching roots definitely play a big part in where I am today in this silver business as well as my professional career. It’s a whole different lifestyle and culture to live in Jordan, one I am so thankful for. The community as a whole supports each other. When I was first starting out the first orders I had were from community members. And I thank God for those sweet people! Those orders were rough! Now that I have learned and progressed so much in my work, they are still supporting me! So shoutout to all of the people who supported my business through the rough years, THANK YOU!! 9. What do you listen to in the shop and on the road? It really depends on my mood. I have every preset from country (heaven forbid not that new pop/country crap, that is pure sh!t), classic rock, classic country, todays hits, and Christian. When I’m on the road right now I’m listening to Christian music and Joel Osteen sermons because it makes a difference in my moods being filled with the word. Like I said it depends on the day. Some days (or for a song) its Eddie Rabbitt, then maybe it’s Reckless Kelly or some Nelly. But when in doubt its always Dwight Yoakam, ah Dwight <3 I love to channel surf so my music taste can vary every minute! Thanks for reading through another edition of our #WesternWomenWednesay, featuring pillars of community, acceptance and motivation! I encourage you to get a jump on your holiday shopping with Catie, as well as follow her inspirational story on social media!